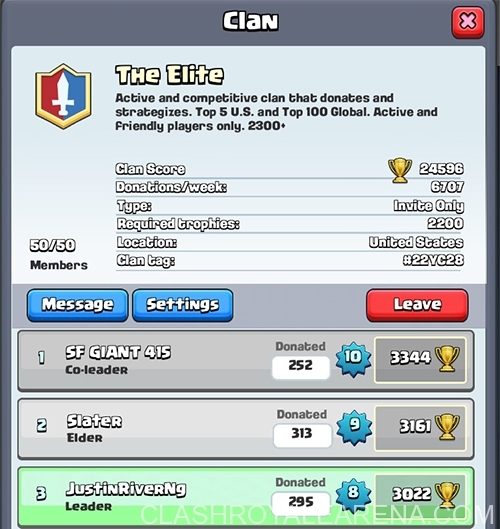 Hey guys, this deck was shared by Justin (leader of the Clan “The Elite” which is ranked at #5 US) and I’m here to showcase a deck that needs some love! Hog – There are 2 staples in this deck and hog is one of them. Hog absolutely cannot be replaced as it’s the main offensive card. Any other card changes the deck / strategy entirely. Freeze – Freeze is the other staple and synergizes with just about every card in the deck. Fireball – In this meta, it’s crucial to have a spell damage card. It’s not required, but many decks need at least one spell damage card to be viable (this is one of those decks). Lightning and rocket won’t cut it because they don’t provide cheap splash damage. Tesla – Without tesla, this deck would be super weak against air troops. Also, tesla provides great defense to ground troops too! Cannon – Since this deck sits at such a low elixir cost, often times there is excess elixir in your hand, but you aren’t ready to attack. Therefore, cannon is a nice card to drop for defense while you set up your attack. Skeletons (1 elixir) – Synergizes so well with freeze because they do so much damage for 1 elixir, they just have low health is the flaw. However, freeze plays around that flaw because it freezes their damage. Skeletons also act as a super cheap distraction while your defensive buildings have time to shoot. Spear Goblins – They provide ranged defense and offense. They can also provide distraction like the skeletons. Along with the tesla, this card allows for easy handling versus air troops. Knight – I may be biased toward this card, but I truly believe it’s great for this deck. The troops used in this deck are so susceptible to splash damage and knight is the cheapest counter to that. Example: Many people follow up golems with splash damage like bomber, princess and wiz. If you drop your goblins or skeletons, they’ll just get dumped on quickly. However, if you drop knight to tank the splash damage then drop the small troops to target the golem or the opponent’s backup troops, then you should be good. This deck is HEAVILY reliant on freeze. Being precise with freeze is one of the biggest factors when it comes to climbing high with this strategy. Your offense is basically hog + freeze (often times with skeletons and spear goblins too when you have extra elixir or when you have those troops left over from defending). You don’t want to attack obviously when your opponent has high elixir, so you mainly defend THEN attack. If you want to attack first because your deck is filled with offensive cards, (like hog + freeze + spear goblins + skeletons) be weary not to overspend. Defending isn’t too difficult with two buildings and fireball, but you definitely want to be cautious when you defend too (so that you don’t overspend on defense because the extra elixir can be used for offense). If you successfully defend and spend less than your opponent, you will have more elixir on your attack. If you successfully defend and spend more than your opponent, you can still attack and use the leftover tesla and cannon health to help defend the next attack. If nothing is happening, drop buildings when you’re near 10 elixir. I know this is simple but I always see people forget this in the middle of the match because they lose their cool. Dropping too early wastes the lifetime of the building. When you’re opponent is low on elixir, ATTACK. Buildings should generally be dropped in the middle, and 4-5 tiles above the king tower. Cannon has to lean toward one side, so learn toward the side that you need to defend more or the side that you plan to attack. Use skeletons to distract troops while your defensive buildings take them out (make sure you do this in range of all your buildings so that you’re maximizing the usage of your defenses). Use fireball on barbs or minion horde. If they have both, use them on barbs generally and have your tesla and spear goblins defend against minions. If your hog is directly behind a knight, it can push the knight quickly forward to their side of the base. When you freeze their building(s), don’t freeze immediately. Wait till your hog is about half health, that way you can patiently wait to see if they drop troops also. Freezing buildings + troops is better than freezing just buildings. If you are going to fireball a building with hog running at their tower, do so early because if the hog needs to attack the building and you fireball too slow, the hog may do more damage than necessary. When you drop hog to go for a tower, drop it all the way on the side, it may avoid targeting towers in some cases. Freeze can be used defensively too. If you have defensive buildings and troops up, freeze can give you so much time to get off a TON of damage. If one of your opponent’s tower is very low and the game still has a lot of time, start targeting the other tower. If you get rid of the tower too early and the game is 1-1, their king tower will make it harder for you to get the second tower. However, if you leave one tower alive at low health, you can start going for the other tower and just finish the first one off with less than 30 seconds left (I do this often but only when a tower can be fireballed to death). If you’re opponent has lightning, try to keep only one defensive building up at a time at most. If you do this, you can drop another defensive building to defend after they get rid of your first one so that their lightning doesn’t get that much value. Golem – Golem is pretty easy. Whenever they drop elixir collector or golem, that’s an opportunity to attack with hog + freeze and you should get a lot of damage off on a tower due to that. When defending, drop knight behind the golem to tank and while your other troops and buildings attack the golem. Be careful because the explosion can destroy your troops. So many buildings – This is the toughest deck against hog. You need to generate a lot of value from fireball by making sure to target their buildings and troops at the same time. When you push offensively, use more elixir than you usually would by dropping all your troops to reinforce your attack. If I win this matchup, my opponent often times makes a mistake (but everyone makes mistakes, you just have to capitalize on it). If you can’t do anything about this, go for a draw. Pekka – Pekka is easy too. You have skeletons and spear goblins, it shouldn’t be tough. Attack the other lane with hog + freeze (save your other troops) when he drops pekka. Prince / dark prince – Make sure you have your buildings ready for their offensive attack. Drop knight to take both charges first, then drop your other troops behind the prince. Dark prince is usually in front so dark prince should be taken out pretty quickly by your buildings and then your troops should be able to distract the prince. 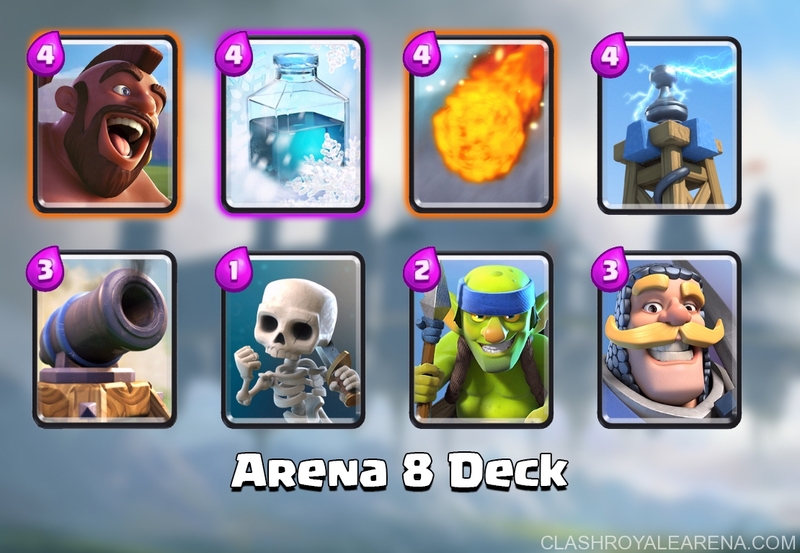 Xbow or mortar – This matchup requires a lot of skill. Once one of your tower takes some hits, you know they’re going to aim for that tower for the rest of the game. Drop buildings all the way up on the side they’re targeting and you should be fine because your small troops can distract whatever they drop while your defensive buildings do damage. Tesla can reach xbow or mortar if it can attack your tower but cannon can’t if they place it perfectly. If you drop cannon in front of your towers though, the mortar will target that. It’s hard to explain because it’s so fast paced but trust me, you’ll figure it out over time as long as you pay attention to what tower they’re targeting.